Bending and twisting of plywood elements is governed by the dominant grain direction, and is often minimized -if not avoided- in conventional architectural and engineering designs. 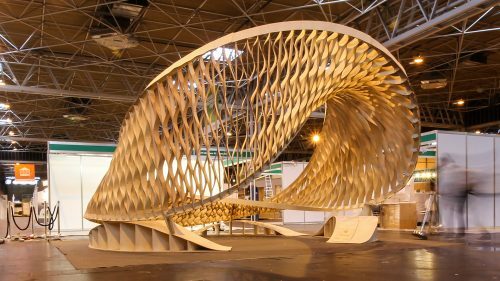 The Twist, however, seeks to gain full control on such material behaviour, exploiting the anisotropic properties of plywood to achieve a material system capable of producing articulated surfaces by the orientation of its elements. 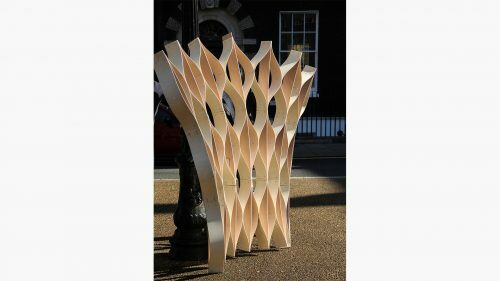 The system is primarily composed of two plywood strip elements: the ‘ribs ‘and the ‘wings’. The former are planar arcs, which serve primarily a structural function, and are CNC-milled from 6mm plywood sheet to obtain the desired profiles with the grain direction oriented for high longitudinal stiffness. The latter are 4 mm thick straight strips, with the grain perpendicular to the length of the 12 cm strip. These are connected to the rib elements at specific angles and distances in order to obtain both bending and twisting. 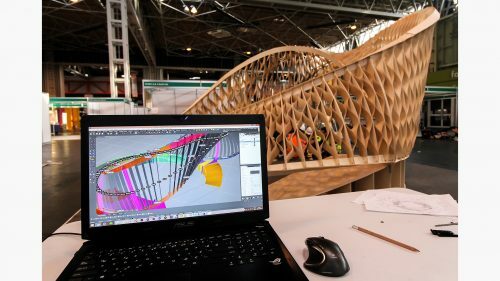 The rib elements are essentially working as a means to trigger the inherent physical properties of the thin wings which create the characteristic sinusoidal curves on the surface. A subsystem, defined by two major elements referred to as ‘combs’ and ‘perps’ runs along the free edges of the articulated surface. It serves to lock the geometry in place as much as guide the positive location of rib elements during the assembly process. 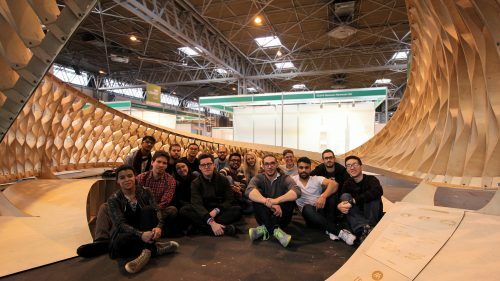 The project capitalizes on the material effects of milled plywood that have been observed in 1:1 tests conducted by the EmTech studio, thus making the testing process central to the design endeavour. The computational techniques used to generate forms were calibrated and fine-tuned based on the results of physical experiments that identified the possible range of geometries, and served as the bridge between the physical and digital realms. 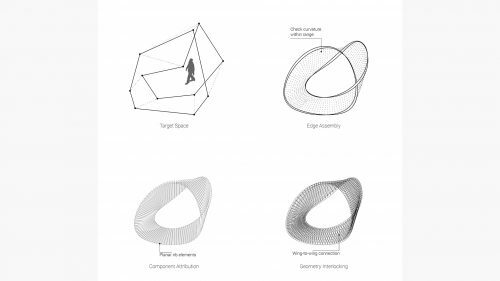 The twisting geometry chosen for the material exploration has been designed to accommodate for the specific ability of the system to achieve synclastic surfaces. 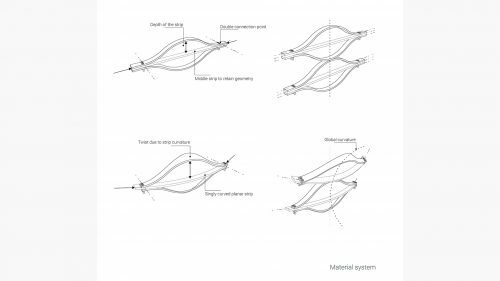 This information feed, from material logic to form, further increases the direct coupling between material information and construction. By relating design logic and fabrication techniques to the inherent material behaviours and dimensional limitations of the sheet material, the project is resolved as a light, pellucid, surface where use of material leaves spaces for light and wind to permeate.